Tinder has found a new way to for people to instantly judge their prospective hook-ups/life partners. The company announced today that it’s launching a partnership with Spotify, where users can link their accounts on the two platforms and choose “Anthems” for themselves. Tinder has a very corny answer for what actually defines an Anthem, posting on its blog: “It’s that one single track that tells your story. That one song you can’t get out of your head. Where the lyrics of your life meet the rhythm of your soul. It may change as you change, but at any given time, you have an anthem—and the world is waiting to hear it.” To us, it just seems like a throwback to the era when autoplay songs on Myspace pages were a thing. The app will also show potential mates whether or not they have any artists in common. 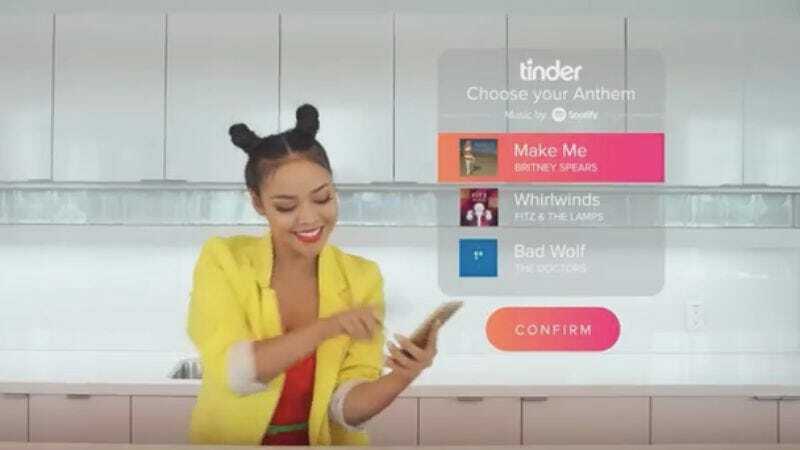 Tinder’s obviously teasing this all as another way to make a potential love connection—We like the same music!—but to the more cynical among us, it just seems like a way to make fun of strangers more easily. Unless everyone takes to employing this feature ironically—which is a definitely a possibility—we can imagine how this is going to go: Current ubiquitous pop hit? Swipe left. Pretentious indie track? Swipe left. “Livin’ On A Prayer?” Swipe left. Still, if the below promo video is to be believed, it will turn your life into (500) Days Of Summer.